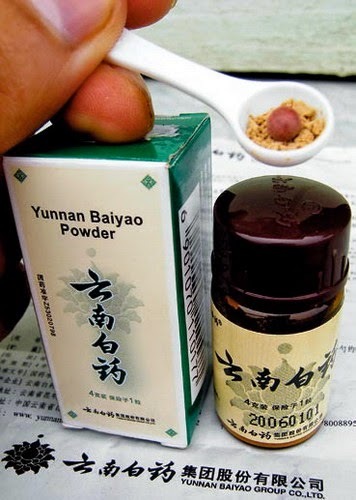 A Guangzhou dermatologist got a very rude shock when he posted a report of a possible adverse reaction to one of China's most popular traditional remedies, Yunnan Baiyao (an astringent said to be good for wound healing). The remedy is a multi-million yuan bestseller product for its Yunnan manufacturer, and they obviously have a lot of 'guanxi' and clout with the law enforcement authorities. Two years ago a Guangzhou dermatologist Dr Liu Xin posted a report on Weibo about a young girl who had an adverse reaction to some medicine that her family used on an open wound. The post advised caution in using excessive topical antiseptic products on wounds. Dr Liu did not even mention Yunnan Baiyao by name, but it was fairly obvious to readers which product the girl's family had used (in addition to mercurochrome antiseptic). The original post was circulated quite widely and has occasionally resurfaced over the last two year. Dr Liu had almost forgotten about it, until the police came knocking on his door recently. The police had been sent by Yunnan Baiyao, who wanted the post retracted. They claimed that Dr Liu was trying to damage their corporate reputation and wanted hims charged with being involved in an extortion attempt against the company. They acused Dr Liu of deliberately spreading false and malicious rumours to discredit Baiyao - and they wanted to make an example of him. The police posed questions to him such as - "has the picture of the wound been Photoshopped? ... How come you don't remember this family's exact details?" and "did you verify with proof that these medicines were used and caused the disfigurement?" Dr Liu said he was amazed to be accused of a crime for doing his job - as a licensed dermatologist it is professional duty to treat cases such as this - and his public duty to report on matters where injury may be avoided in future. The police did not press charges against Dr Liu, but he says that even though he was 'exonerated' he has been left with a sense of fear and intimidation. How many others will choose to remain silent in such circumstances by such heavy handed tactics? Fortunately, online commentators have now circulated the latest news about Dr Liu's 'persecution' by Yunnan Baiyao - and exposed their use of police to put pressure on any public criticism of their product that threatens their commercial interest. Commentators say this is a clear case of freedom of speech being suppressed for financial reasons, and abuse of police powers to protect a commercial organisation. They say it is a typical case of s powerful local company relying on police to defeat perceived threats to their interests. They say it also underlines the lack of trust in Chinese society generally and the lack of trust in health products in particular. Anything on telly? "The Obstetrician"